After 1 week of recovery of doing nothing, I've started my training this week. I've started running and will continue to run everyday until 5th December - Bukit Shahbandar Challenge. My target is to improve my time and if possible to get a better ranking/position. This year they change the categories. 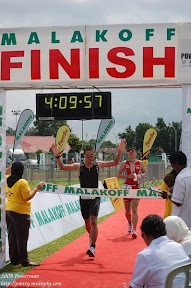 Elite Categories (National), Amateur Categories and Age Groupers. I've decided to join the age groupers rather than joining the Amateur categories (open to all AGE). In my categories, I'm the youngest and that means I have the advantage of being young and faster. I just wish those in my group are not as fast as I am. Keep on dreaming..............that will not happen.